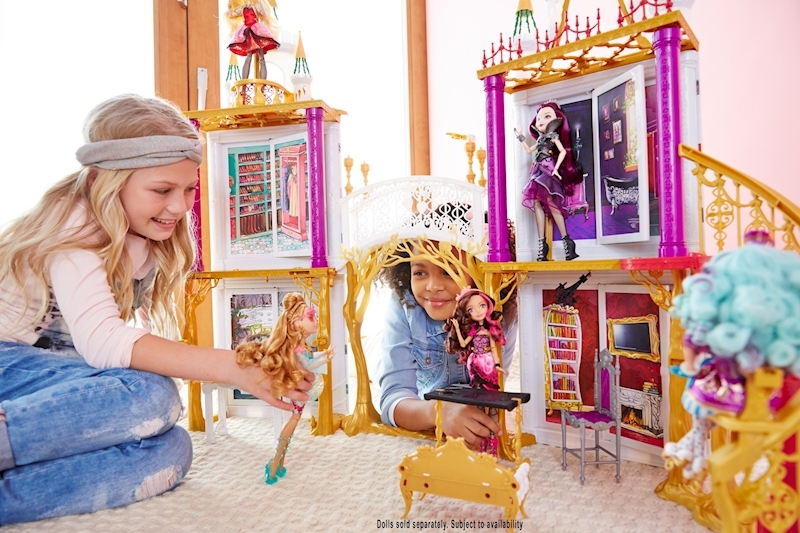 The magnificent turreted structure features two stories, four character-themed rooms, a gliding bridge and a winding staircase that lets dolls (sold separately) ride all the way down! On the first floor are a surprise vanity inspired by Holly O'Hair™ and a living room with sofa themed for Apple White™; the second floor is home to a closet perfect for Ashlynn Ella™ and a bathroom with royal throne designed for Raven Queen™. But wait -- each room transforms from a castle theme to a high school setting with the flip of a wall. Turn the closet into music class and flip the mirror over for a desk! Turn Holly's vanity into the lunch buffet. It's double the storytelling fun!